By: Potts, I. 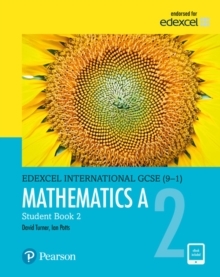 A., Turner, D. A.
Edexcel International GCSE (9-1) Mathematics A prepares students for the new 2016 International GCSE (9-1) Mathematics A specification. Together, Student Books 1 and 2 provide comprehensive coverage of the Higher Tier specification. This book, which includes access to the eBook, is designed to provide students with the best preparation possible for the examination: Written by highly experienced International GCSE Mathematics teachers and authors David Turner and Ian PottsIntegrated exam practice throughout, with differentiated revision exercises, exam practice and learning summary sectionsSignposted transferable skillsIntegrated Pearson Progression ScaleReviewed by a language specialist to ensure the book is written in a clear and accessible style for students whose first language may not be EnglishGlossary of key Mathematics terminology, along with full answers included in the back of the bookFree eBook includedInteractive practice activities and teacher support provided online as part of Pearson's ActiveLearn Digital Service.